A very thin cakey layer topped with an ooze of sugary butter goodness. From Holmesburg Bakery, this is my favorite butter cake. In Northeast Philadelphia, everyone has their favorites. Rillings Bakery on Southampton Road, The Danish Bakery in Fox Chase, Holmesburg Bakery on Frankford Ave and even as far away as Croydon in Lower Bucks at Fritz’s Sticky Buns, where the buttery topping will ooze and fill up the space where you just cut a piece. When I lived in Florida, people looked at me funny when I would ask if anyone knew where I could get one. After checking in with Mom, who of course fed me this confection since I was a child, I found out it’s a Philadelphia thing. You know. Like Scrapple. Philly Cheesesteaks. Or Tastykakes. Well yeah, it’s gooey, but it’s not usually part of the title. But. Wait! There’s butter cake in St Louis? Yes, Barbara, there is Butter Cake in St Louis. Actually an internet search brings up many more instances of St Louis Butter cake than Philadelphia. I intended to visit St Louis anyway, The City Museum has been calling since I viewed Cherie’s video blog post about it. So this past June, Wendy and I took a road trip with a stop in St Louis. Here’s what I found out about butter cake while out there and since returning. The St Louis and Philadelphia butter cakes are definitely different animals but with a common ancestor: Butterkuchen. Butterkuchen is a German cake with a buttery sweet topping. Usually a breakfast or coffee cake, it’s a little tricky to get right. But as German immigrants entered the United States, their recipes followed and evolved regionally. As I mentioned earlier, in Philadelphia everyone has a favorite place to get their butter cake, usually a neighborhood bakery. In St Louis, it’s more of a homemade treat- everyone has a favorite recipe. It’s served at family functions, backyard parties and special events. The “store bought” St Louis butter cakes just aren’t as good, with exceptions of course. In St. Louis, most of the recipes use cake mix as a base with modifications. Then the topping is made with cream cheese, eggs and powdered sugar. It’s very important not to overbake. The Philadelphia butter cakes do not contain any cream cheese. The bakery I spoke to creates the base from a yeast based recipe and the topping is made with butter and sugar. And no, they didn’t share the recipe with me. 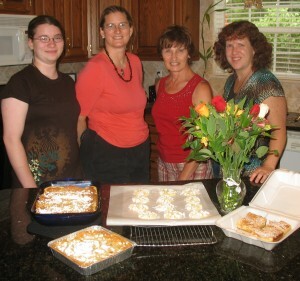 This was a fun research project that required hard work tasting and making butter cake. I suggest you try it yourself. If in Philadelphia, look in the Northeast for the bakeries I listed above. 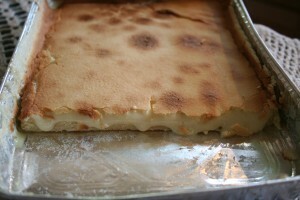 If you aren’t in the area, then just take a recipe and make a Gooey St Louis butter cake. I’ll post the recipes in another post. I especially want to thank Kathy Dunphy who, not only shared her home with Wendy and I while we stayed in St. Louis, but opened up her kitchen and family recipes to share with me for this project. Posted in: Butter Cake, Food, Travel. This entry was posted on Saturday, September 4th, 2010 at 6:27 am	and is filed under Butter Cake, Food, Travel. You can follow any responses to this entry through the RSS 2.0 feed. Both comments and pings are currently closed.